In this blog article, we will discuss some of the key differences and/or similarities between these two top-of-the-line heat wire products. This topic covers product designs, layout methods, installation techniques and other various aspects. Should you have any questions, please feel free to contact us anytime. Cost Comparison: In addition to the numerous advantages RPM has over the Ditra Heat, based on 2018 pricing from two US-based national home improvement centers, the RPM and Ditra Heat are very comparably priced. Also, for a small minimum order size, the RPM mats come with free shipping within the continental US. Thickness: One common misconception is that Ditra Heat is thinner than RPM. While Ditra Heat may be slightly thinner than RPM, the recommended trowel size for installation of Ditra Heat using thinset is a 1/4″ x 1/4″ square notch trowel. When it is pressed into the thinset it flattens out to a 1/8″ thickness under the Ditra Heat, putting the total installation height slightly higher than RPM-330 or RPM-V1. Wire Protection: Since the Ditra Heat has it height under the mat it places the heat wire right at the surface. 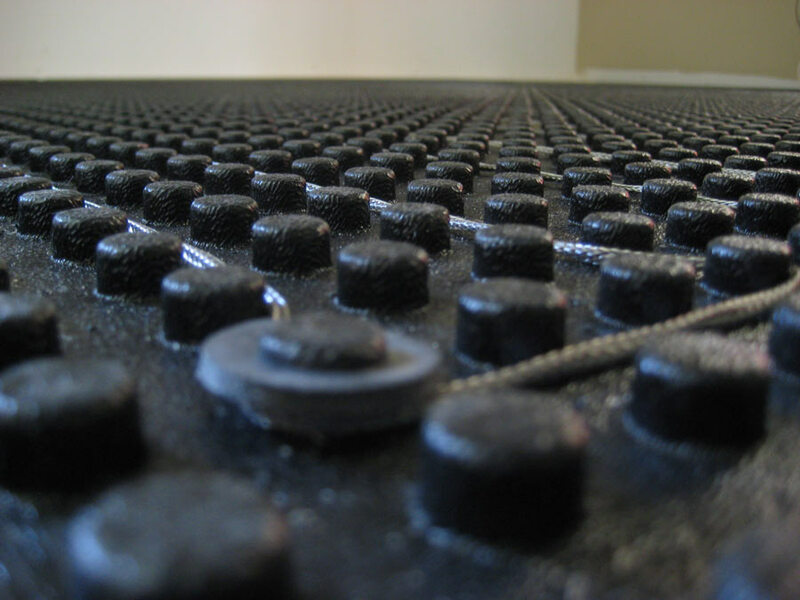 With RPM the heat wire lays at the bottom of the mat, closer to the subfloor, putting approximately a 1/8″ under the surface of the studs. This means with RPM the wire is better protected from foot traffic, trowels, or other tile installation or removal tools. Spacing Options: With RPM’s 1/2″ diameter studs you can space a heat wire at any 1/2″ increment starting at a 2″ spacing depending on the brand of heat wire used. With Ditra Heat’s 1-1/16″ stud, there is only one minimum spacing option. Why is this important? With all heat wire manufacturing companies, the lengths have already been precut to cover a certain amount of square footage. These precut lengths cannot be altered/cut shorter due to the use of a certain gauge of heat wire depending on the length. This means you have to use the entire spool of wire. This is where having 1/2″ incremental spacing options is important. For most indoor electric heat wires on the market today, every 1/2″ spacing difference is about 5 degrees in temperature difference. With RPM you can make the adjustments if needed to fit the heat wire in the space and only have a 5-degree temperature difference in a certain area of the floor. While you may be able to tell there is a slight difference in temperature, with Ditra Heat any adjustment outside the recommended spacing could result in a significant 10-degree difference in temperature because of the 1-1/16″ stud diameter. Installation Methods: It has been said that with Ditra Heat you do not need to mix a leveling cement to cover the wire before you adhere tile with a thinset mortar. That is true, however, with RPM you do not need to mix a thinset mortar to adhere the RPM to the subfloor. The adhesive for RPM is an already premixed vinyl adhesive or equivalent, just open the bucket and spread on the floor. It is just reversed as to when you will have to mix a cement mortar during installation. When finished, if there is any vinyl adhesive left over, put the lid back on and save for the next job. With Ditra Heat’s thinset adhesive, any leftover gets tossed. It has also been said that with Ditra Heat you do not need to apply a bonding agent to the surface before you apply thinset. That is true as well, however, the reason a bonding agent is recommended over RPM before a leveling cement is applied is because cement does not stick to plastic very well without a bonding agent. With Ditra Heat, what is holding the thinset to the surface are the indents in the center of the Ditra Heat stud designed to hold the mortar. With RPM, using a quality bonding agent and leveling cement, good luck trying to get the mortar off the RPM. Also, with Ditra Heat, no stapling is required. With the new RPM-V1, no stapling is required as well. Uncoupling vs Anti-Fracture: This topic can be confusing. What is known for sure is RPM Mats have tested at the highest classification (“high performance”) for anti-fracture over a concrete substrate. What that means is, if the concrete substrate the RPM is installed on gets a crack up to an 1/8″ wide, the crack will not transfer through to the tile above. In regards to Ditra Heat being an uncoupling membrane, what is that? According to Schluter, an uncoupling membrane “allows for in-plane movement that effectively neutralizes the differential movement stresses between the substrate and the tile”. That in effect is what an anti-fracture membrane does. Tile Adhesion: With RPM, once the cement leveler used to fill the RPM Mat has dried you have a wide variety of choices for thinset used to adhere tile to the surface, including the contractor preferred, polymer modified thinset. With Ditra Heat they recommend using a non-modified thinset (no polymer modification) to adhere tile. Natural Stone Installation: Since RPM is a backerboard replacement product over a wood substrate and the leveling cement used to fill the RPM Mats strengthens the floor, only a standard 3/4″ thick plywood or OSB substrate over 16″ floor joist centers is needed to install natural stone. With Ditra Heat, Schluter recommends a double-layer wood substrate to install natural stone tiles, thus adding considerable height to the installation. Minimum Tile Size: RPM can take the installation of mosaic tile as small a 1/4″ x 1/4″. Ditra Heat’s minimum recommended tile size is 2″ x 2″. Floorcovering Options: Since the heat wire installed in RPM is completely buried in a cementitious mortar bed, the options for installing different types of floorcovering other than tile, greatly increase. Some options include sheet vinyl, laminate flooring, engineered hardwood, bamboo flooring, and carpet. Ditra Heat offers no other options other than tile floor covering. Although tile remains the most effective flooring for heat retention and release, with RPM at least you have options. Toughness: The studs on the RPM are extremely tough. An NFL lineman might be strong enough to crush one stud on an RPM Mat, maybe, but highly doubtful. With Ditra Heat, any person with average strength could crush a Ditra Heat stud using only a thumb. Wire Testing: With major brands of electric in-floor heat wire that RPM Mats recommend using, only a standard ohm test between the heating element leads and the ground wire are required before, during and after installation. With Ditra Heat, the above-mentioned test is required along with an additional test using a megohmmeter in order to be compliant with Schluter’s warranty requirements. This product would need to be purchased at a considerable cost or rented. 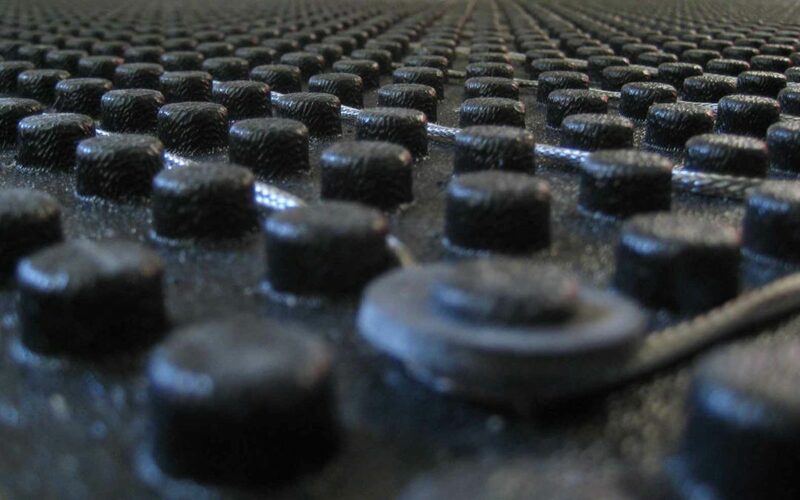 Manufacturing: RPM Mats are made in the USA from 80-90% recycled materials. Total sq ft of RPM area? Will this be the primary heat?